When I got a copy of Ezra’s book, Shakedown: How Our Government is Undermining Democracy in the Name of Human Rights, and began reading it, I started thinking about the implications for the life debate. Not too long ago, no one knew what Human Rights Tribunals were, and where people had heard of them, they just didn’t care. Not unlike the abortion debate–people just don’t really care. 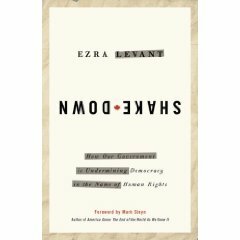 There have already been really good reviews of Ezra Levant’s Shakedown: How Our Government Is Undermining Democracy in the Name of Human Rights (see here, here, and here). So I will keep mine short if not sweet: I’m sorry Ezra, but your book is horrible. Oh, it’s well written, sure. It’s also very well researched, yes. It tells the story from point A to points B and beyond in a clear, orderly manner. But you see, that’s my problem: Your story is a horrible one. How we got to the point where the state routinely prosecutes people for their opinions is something I have a lot of trouble understanding. Part of me desperately wants to avoid noticing it. But Ezra’s book forces me to. The serious problems he outlines don’t just concern a few religious guys who express themselves clumsily and professional talking heads like Ezra and Mark Steyn (who seems happy to describe himself in the foreword as “a blowhard, a loudmouth, a self-promoter, a ‘controversy entrepreneur’, etc”). No. It concerns you as well. If you (yes, you, Mr. and Mrs. NormalPerson, you personally) accept that the state has any business prosecuting anyone for his or her non-PC opinions, you will have no protection and no defence when the state decides your opinions, no matter how “normal” you believe them to be, have become non grata. And unfortunately, given the way these things normally work, if you don’t speak up, you are deemed to have accepted this kind of systematic state censorship done in your name, using your money. So please. Start by reading Ezra’s book (you can order it from Amazon, here), and speak up. Every chance you get. Ezra’s horrible story concerns us all. We are really awfully close to Newspeak around here, where government agencies claim you won even when you have, in fact, lost something. Talk about doubleplusungood. Ezra Levant needs help – read the details here. Ezra is a free speech absolutist, and so am I. Regulated speech ain’t free, and as long as we have nitpicking bureaucrats telling us what cartoons we’re allowed to print and what kinds of jokes comedians are allowed to make, we won’t have free speech. The difference is that he’s the one fighting the legal battle, not me. The least I can do is send him some money and ask my readers to do the same. We all benefit from what he’s doing, but it’s not just that. What he’s doing is right. So. Please consider making a donation. It doesn’t have to be very much – if enough people give $10 or $20, it will make a big difference. If you can afford a bit more, please do (I put in $200 so far). Not only will you help Ezra fight the good fight, but you’ll annoy all the right people, too. 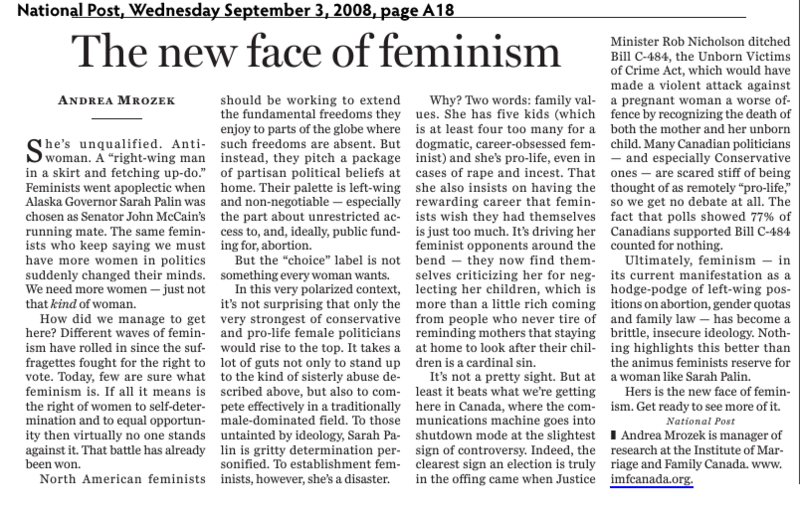 Andrea adds: If I were to drop the fight against abortion (which I have no plans to do) it would be to fight against the limitations currently placed on freedom of thought in Canada. But then again, maybe I don’t have to drop one to fight the other. The two are linked. Everytime a pro-lifer shows a sign-a factual sign-of what an abortion is there are cries of “That’s offensive!” and said sign is, in many cases, forcibly taken down. There are no official bodies telling me I must refer to killing unborn children as “a woman’s right to choose”–so many do that as a function of self-censorship. In any case, we ought to fight censorship in whatever form it takes. I am glad that Ezra is fighting this so vociferously, and believe we ought to support him. I think we all need to thank my former employer Ezra Levant for this. That Alberta Human Rights Tribunal employee worked for her (taxpayer-funded) pay that day. Ezra Levant: I published those cartoons to use the maximum freedom allowed. I published it without reservation. I published it in the most unreasonable manner. Bureaucrat: What do you mean by unreasonable? Ezra Levant: Whatever offends you most.